Circa 1905. "Buffalo, New York, Main Street." A bird's-eye view of Buffalo. 8x10 inch dry plate glass negative, Detroit Publishing Company. View full size. Submitted by Thump on Tue, 07/05/2011 - 9:51pm. Why are there no flags flying in this picture? They are so prevalent in all the other photos on the site their absence sticks out like a sore thumb. So many bare flagpoles! Submitted by jimmylee42 on Tue, 07/05/2011 - 8:07am. 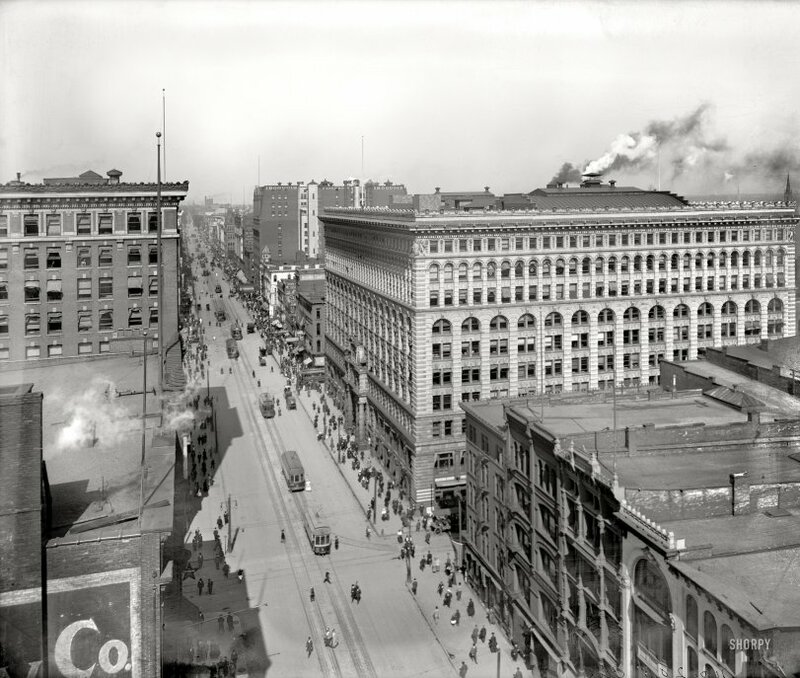 In the early part of the 20th century Buffalo was in the top 10 highest population cities in the country. According to stats of 1900 it was almost 10 times the size of LA in numbers. Of course LA boomed in growth later on. Submitted by PaulRJohnson on Mon, 07/04/2011 - 11:18pm. This seems like an huge number of trolleys just for this street! Submitted by adam-randazzo on Mon, 07/04/2011 - 5:52pm. The Ellicott Square building is such an amazing piece of architecture. Having worked in the building for some time, I can honestly say I loved walking into the office every day. If you are ever in Buffalo, make sure to visit it -- it is still a spectacular treat.